First published at the Washington Examiner, July 30, 2014. A joint investigation by the Washington Examiner and the nonprofit watchdog group Judicial Watch found that former President Clinton gave 215 speeches and earned $48 million while his wife presided over U.S. foreign policy, raising questions about whether the Clintons fulfilled ethics agreements related to the Clinton Foundation during Hillary Clinton‘s tenure as secretary of state. According to documents obtained by Judicial Watch and released Wednesday in an ongoing Freedom of Information Act case, State Department officials charged with reviewing Bill Clinton’s proposed speeches did not object to a single one. The documents also show that in June 2011, the State Department approved a consulting agreement between Bill Clinton and a controversial Clinton Foundation adviser, Doug Band. The consultancy with Band’s Teneo Strategy ended eight months later following an uproar over Teneo’s ties to the failed investment firm MF Global. State Department legal advisers, serving as “designated agency ethics officials,” approved Bill Clinton’s speeches in China, Russia, Saudi Arabia, Egypt, the United Arab Emirates, Panama,Turkey, Taiwan, India, the Cayman Islands and other countries. The memos approving Mr. Clinton’s speeches were routinely copied to Cheryl Mills, Hillary Clinton’s senior counsel and chief of staff. Mills is a longtime Clinton troubleshooter who defended the president during his impeachment. In the Benghazi affair, Mills reportedly berated a high-ranking official at the U.S. embassy in Libya for talking to a Republican congressman. Unraveling Benghazi: Is Mike Rogers Part of the Problem? First published at the Daily Caller, June 17, 2014. With the curtain soon to go up on select committee hearings on Benghazi, a key question remains unanswered: what on earth were we doing there? What policies were being pursued in that violent outpost of the Libyan revolution? The White House would rather not say. In an email obtained by Judicial Watch and released in April, senior White House communications advisor Ben Rhodes instructed administration media spinners in the aftermath of the attack to “underscore that these protests are rooted in an Internet video, and not a broader failure of policy.” For all the sound and fury over hearings, Congress also has not shown much interest in precisely what Ambassador Christopher Stevens, the State Department and the CIA were doing in Benghazi. A spokesperson for the House Intelligence Committee noted that “strictly observed and enforced” policies required “that there should be no interaction with Mrs. Rogers on any matter relating to the official business of the House” and “no interaction between the Committee and any representative of Aegis.” There is no evidence of wrong-doing by Rep. Rogers or Aegis. Indeed, the outlines of the story are more suggestive of “right-doing,” Washington-style: an insider’s game of covert operations and corporate profits played out in the gray areas of law and policy. No issue has dominated Rep. Roger’s time as committee chairman more than Libya. Protests against Muammar Gadhafi’s regime began in February 2011. In March, NATO air strikes commenced and the U.S. named Christopher Stevens as special envoy to the Benghazi-based Libyan opposition. By August, the end of the Gadhafi regime was in sight. The Associated Press reported that the CIA and State Department were “working closely” on tracking down the dictator’s vast arms stockpiles, including chemical weapons, yellowcake uranium, and some 20,000 shoulder-fired missiles known as MANPADS. State Department spokeswoman Victoria Nuland told the AP that Mr. Stevens was working with officials in Benghazi on how to track down the weapons. By early October 2011, concern over missing MANPADS was growing. Prized by insurgent forces and terrorists, MANPADS (the acronym stands for “Man-Portable Air Defense Systems”) are capable of shooting down attack aircraft — or a civilian plane. “We have reports that they may in fact have crossed borders,” Mr. Rogers told USA Today, criticizing the Obama administration for a lack of urgency. “I have some concerns we may be a little bit late.” By the end of the month, Gadhafi was dead. Less than a year later, Mr. Stevens — by then Ambassador Stevens — would be dead too, killed with three other Americans in an attack on the Benghazi stations of the State Department and CIA. Benghazi became a full-blown crisis. Chairman Rogers emerged as one of the Obama administration’s sharpest critics, hammering it for a lack of transparency. Libya also was an area of activity for Aegis, Ms. Rogers’ company. As Rep. Rogers assumed control of the Intelligence Committee, an Aegis subsidiary, Aegis Advisory, began setting up shop in Libya. “Aegis has been operating in Libya since February 2011,” noted an Aegis Advisory intelligence report aimed at corporate clients. The report, marked “Confidential,” notes the company’s ability to provide “proprietary information [and] expert knowledge from our country team based in Tripoli.” Security was part of the Aegis package, too. “Aegis has extensive links in Libya which can be leveraged quickly to ensure safe passage,” the report noted. In 2012, Al Jazeera reported that Aegis was hunting bigger game in the country, “seeking a $5 billion contract to guard Libya’s vast and porous borders.” Aegis declined to respond to Judicial Watch’s questions about Libyan border security contracts. Ms. Rogers’ rise at Aegis was swift. A former press aide to Ambassador Paul Bremer in Iraq and an assistant commissioner for public affairs at U.S. Customs and Border Protection, she was named executive vice president when the U.S. branch opened in 2006. She was promoted to president in 2008 and added the position of CEO in 2009. In 2011, Ms. Rogers was named vice chairman of the company’s board of directors. In December 2012, she left Aegis and joined the law firm Manatt as a managing director for federal government affairs. In 2007, Aegis won Pentagon renewal of a contract to run security services for reconstruction projects in Iraq, a deal “worth up to $475 million over two years,” the Washington Post reported. In 2011, it was awarded a $497 million State Department contract for embassy security in Kabul, Afghanistan, according to the Project on Government Oversight. Theories linking Aegis to the failed Blue Mountain Group guarding the State Department’s Benghazi mission have circulated on the Internet. Aegis issued a statement denying it. No “member of the Aegis Group has ever entered into a contract with any department of the U.S. government to perform work in Libya,” the company noted. A definitive statement about Aegis in Libya, apparently, but not without wiggle room. The activities of the U.S. government, its allies, and private contractors in Libya remain cloaked in secrecy. Methods to sidestep Congressional oversight include handing off sensitive missions to friendly foreign governments or operating through shell companies. There’s no evidence that Aegis was involved in such misconduct, but Ms. Rogers did seem to have been focused on boosting Aegis’s capability for confidential operations. According to a biographical profile posted on the Manatt website and since removed, Ms. Rogers “obtained top-secret facility security clearance for Aegis, created the company’s board of directors and positioned it for future growth and expansion.” Among the new Aegis board members were two former senior CIA officials: Robert Reynolds, a leader in contracts and procurement for the CIA; and John Sano, a former deputy director of the CIA’s clandestine services. On March 28, Mr. Rogers announced he was stepping down from his safe Congressional seat and committee chairmanship to become a talk radio host. Two weeks earlier, on March 14, Ms. Rogers quietly left Manatt, after a tenure of only thirteen months. Her departure was not announced and her association with the firm has been scrubbed from its website. Ms. Rogers and Manatt did not respond to emailed questions and interview requests. Messrs. Reynolds and Sano, the Aegis board members, did not respond to interview requests. The State Department and CIA did not respond to questions about Aegis. A lawyer for Aegis declined to address questions about the company’s relations with the U.S. intelligence community and its work in Benghazi. The select committee should take a close look at the CIA’s activities in Benghazi and the Aegis connection. Both Rep. Rogers’ committee and Ms. Rogers’ company were focused on the Libyan security and intelligence environment in the months surrounding the Benghazi attack. Both Rep. Rogers and Aegis pursued Libyan border security issues. And both Rep. Rogers and Ambassador Stevens were linked to efforts to secure Gadhafi’s arsenals, including MANPADS, a high-stakes venture that involved both the State Department and the CIA. Micah Morrison is chief investigative reporter at Judicial Watch. 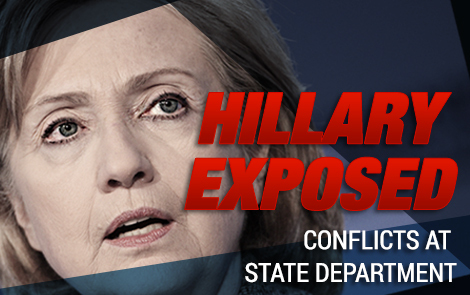 First published at Judicial Watch’s Investigative Bulletin. But as readers of the new book by John Fund and Hans von Spakovsky, “Obama’s Enforcer: Eric Holder’s Justice Department,” will recognize, that ain’t gonna happen—there will be no independent special investigator. Why? Because the only man with the power to appoint a special prosecutor is Attorney General Eric Holder. 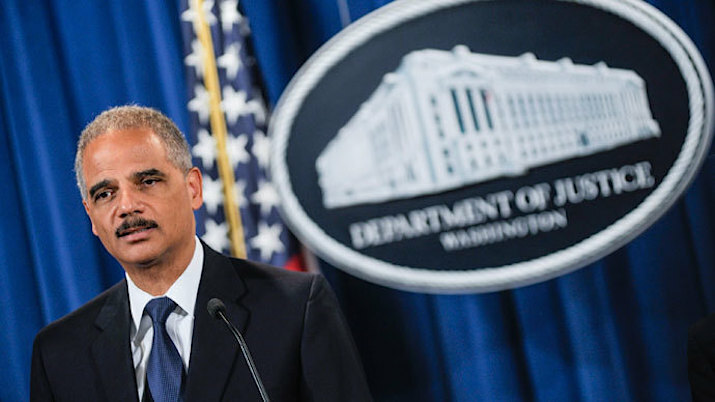 Fund and von Spakovsky detail how Holder acts as a “heat shield” for the administration, protecting the president from a growing series of scandals, while transforming the Justice Department into a stronghold of left-wing activism. In addition to providing a catalogue of the attorney general’s dicey moves, political partisanship and outright outrages during the Obama administration, “Obama’s Enforcer” reminds us the past is prologue, sketching Holder’s tenure as tenure as deputy attorney general in the Clinton Justice Department. Among his notable accomplishments there: shooting down requests by special prosecutors and greasing the skids for a pardon of fugitive money man Marc Rich. If Congress wants an independent special prosecutor, it will have to renew the Ethics in Government Act, which it allowed to expire in a rare moment of bipartisan horror over the aggressive clean-ups of Iran-Contra and Whitewater. If Republicans maintain the House and win control of the Senate in November, they can bring back the independent counsel. Meanwhile, we’ll have to depend on the likes of Fund and von Spakovsky to hold Holder accountable. Debate rages over the rise in children crossing the U.S. border from Mexico and Central America. The numbers are staggering. According to the latest reports, more than 48,000 children were caught in the last eight months alone. At least one federal judge recognized the sinister nature of the enterprise early on. Last December, U.S. District Court Judge Andrew Hanen issued an unusually strong order in a single case of child smuggling. His words should be heeded. An unnamed ten-year-old girl from El Salvador had been spirited across the border, caught along with the smuggler, and then united with her mother—an illegal alien living in Virginia. And there, apparently, mother and daughter remain. The Department of Homeland Security did not arrest the mother, who instigated the conspiracy by hiring the smuggler. It did not prosecute her or move to deport her. “The DHS, instead of enforcing our border security laws, actually assisted the criminal conspiracy in achieving its illegal goals,” Judge Hanen wrote. Read the full Hanen order here. So spoke John Podesta in an interview last fall with Politico, shortly before being named White House counselor. Podesta quickly apologized for the Jonestown jibe and his return to 1600 Pennsylvania Avenue, where he previously served President Clinton, was greeted with deferential nods from the press. “Well respected in political circles both as a strategist and policy thinker,” noted the AP. “One of the Democratic Party’s most seasoned political and policy operatives,” declared the Washington Post. In 2003, Podesta founded the Center for American Progress. By all accounts, it has been a roaring success, serving as a left-wing answer to the Heritage Foundation and a government-in-waiting during the Bush darkness. According to recent data, CAP’s assets top $44 million; its advocacy unit, the CAP Action Fund, holds about $6 million. Podesta also is a co-founder with his brother, Tony, of the lobbying firm now known as the Podesta Group; started in 1988, the Podesta Group in 20l3 reported over $27 million in lobbying fees. In 2005, the New York Times noted that Podesta was one of a “tight-knit group of advisers” forming Hillary Clinton’s inner circle as she pondered a presidential run. He supported Mrs. Clinton in the 2008 primary season, but soon was on board with Barack Obama, directing his presidential transition team. In 2011, Podesta resigned as president of CAP and was replaced by Neera Tanden, a longtime Hillary Clinton aide. According to the Post, Podesta remains “an influential voice in the Clinton political orbit, informally advising Hillary Rodham Clinton in the year since she stepped down as secretary of state.” In his current White House position, Podesta is reported to be focusing on environmental issues, particularly climate change, and particularly policies that can be put in place by executive action, without Congressional approval. The Podesta biography also includes a long history of scandal-management and cover-up for the Clintons. Podesta now says he will serve only a year as counselor to President Obama, but if the going gets tough, expect an extended tenure. Slamming House Republicans as “a cult worthy of Jonestown” is a signal that Podesta will not go quietly into the night. Podesta played a role in managing many of the scandals that surrounded the Clintons, including Mrs. Clinton’s amazing profits trading cattle futures, Whitewater, Monica Lewinsky, impeachment, and perhaps most tellingly, the Travel Office affair. In May 1993, a senior administration official, David Watkins, fired all seven members of the White House Travel Office to make way for Arkansas cronies of the Clintons. A picaresque enterprise with lucrative connections to the airline charter business, the Travel Office handled travel arrangements for the White House press corps—it operated literally on the fly and ran its business in much the same way. President Clinton simply could have asked for the resignations of the Travel Office employees. Instead, in actions directed in part by Mrs. Clinton, the employees were driven from office, cashiered as crooks and lowlifes. Travel Office Director Billy Dale’s experience was especially harrowing: indicted on embezzlement charges, he faced up to 20 years in prison. His career in ruins, he twisted in the wind for more than two years until a jury cleared him of all charges, returning a verdict after deliberating less than two hours. White House officials had unleashed “the full powers of the federal government against the seven former workers,” the Republican-led House Government Reform and Oversight Committee concluded after a lengthy inquiry. “The extraordinary might of the Federal Bureau of Investigation, the Internal Revenue Service and the Department of Justice—not to mention the prestige of the White House itself—were brought to bear.” In a detailed final report, the committee rebuked the White House for conducting “an enormous and elaborate cover-up” of the Travel Office affair. In 1993, Podesta served as Assistant to the President and Staff Secretary. As concerns over abuse of power in the Travel Office affair mounted and the White House fought a public-relations nightmare, Podesta was appointed to conduct an internal inquiry that became known as the White House Management Review. Podesta’s report would become the White House’s first line of defense in the Travel Office affair. It depicted Mrs. Clinton as little more than a bystander in the Travel Office events. The Oversight Committee reported that a “pattern developed throughout the course of the review: information unflattering to the Travel Office employees was included in the report, exculpatory information was not. Deputy White House Counsel Vincent Foster, a close Clinton associate and former law firm partner of Mrs. Clinton, was deeply involved in the Travel Office affair. His goal: protect the First Lady. “Defend management decision, thereby defend HRC role whatever it is, was in fact or might have been misperceived to be,” Foster wrote in a note to himself shortly before he committed suicide, pitching the White House into another crisis. Mrs. Clinton denied playing a role in the Travel Office firings. In a sworn statement, she told the Government Accountability Office that she “did not know the origin of the decision to remove the White House Travel Office employees” and that she had “no role in the decision to terminate the employees.” She repeated the denials in testimony before Congress and an independent counsel inquiry. Watkins—who himself was dismissed from his White House post in 1994 for improper use of a government helicopter—wrote that he had directly spoken to Mrs. Clinton about the Travel Office. She expressed “her desire for swift and clear action to resolve the situation,” Watkins noted in the memo. With the Watkins memo, the ante went up on the Travel Office affair. Had Mrs. Clinton lied under oath? In 2000, a report by Independent Counsel Robert Ray concluded that Mrs. Clinton had given “factually false” testimony about the Travel Office firings. In other words, she had lied. Contrary to her statements, and contrary to the Podesta review, she had played a central role in the Travel Office firings. But Ray declined prosecution, saying that the evidence did not prove “beyond a reasonable doubt” that Mrs. Clinton’s statements had been made with the requisite criminal intent. The cover-up had succeeded. For Podesta, it was a defining moment. Before, he was just another obscure White House aide. After, he was a made man in Clintonland: he had upheld the omerta surrounding the Clintons, protected the First Lady, fended off Congress and the press. In 1997, Podesta was promoted to White House deputy chief of staff. In 1998, he was appointed chief of staff. He presided over the tumultuous final years of the Clinton presidency, a tenure marked by the Lewinsky debacle, impeachment, and a scandal over presidential pardons. Back in the White House now, Podesta is a bellwether for the final Obama years, a political street fighter steeped in scandal management and a loyalist serving two masters—the man who is president, and the woman who would succeed him. It was a savage crime in a savage time. On May 21, 1971, two New York City police officers—one white, one black—were lured to a Harlem housing project by a fake 911 call. Waiting in ambush were three members of the Black Liberation Army, an ultra-violent offshoot of the Black Panther Party. The BLA was unleashing a wave of mayhem and murder across the country. It was not alone. The terrorist Weather Underground had issued a “Declaration of War” against the United States, protests against the Vietnam War were rocking the nation, and a tidal wave of drugs and crime was sweeping the inner cities. As police officers Joseph Piagentini and Waverly Jones approached the housing project, the three BLA assassins came up behind them and started firing. Officer Jones died immediately with four shots to the head. Officer Piagentini took longer. According to court records, he lay on the sidewalk pleading for his life, saying he had a wife and two daughters at home. The killers put twenty-two bullets in him. Three months later, BLA members walked into a San Francisco police station and shot dead the desk sergeant, John Victor Young. Three months after that, Officer James Greene was shot and killed in his patrol van at a gas station in Georgia. In June 1972, two more New York City police officers, Gregory Foster and Rocco Laurie, were gunned down at an East Village street corner. More BLA murders, robberies and hijackings followed. Eventually, the law caught up with the BLA. Three men were convicted in murders of Piagentini and Jones. One of them died in prison. Another, Anthony Bottom, will be up for parole in June. The third man, Herman Bell, has been in prison for the crime since 1973. He appears before a New York parole board next week. Websites such as FreeHermanBell.org and theJerichoMovement.com have mounted campaigns to free Bell, Bottom and other “political prisoners” in the U.S. The Jericho Movement grew out of 1998 rally in support of Bell’s co-conspirator, Anthony Bottom, and defines itself as a national movement with the goal of “gaining recognition of the fact that Political Prisoners and Prisoners of War exist inside of the United States” and “winning amnesty and freedom” for them. The prisoners supported by the Jericho Movement are drawn from a gallery of hard-Left organizations, including the Black Panther Party, La Raza, the FALN, Los Macheteros, the American Indian Movement, the May 19 Communist Organization, and the BLA. The Jericho Movement calls Bell “part of the brilliant liberation movement of the 1960s and early 1970s” and a victim of the FBI’s notorious COINTELPRO counter-intelligence program. In 2010, after denying his role in the New York murders for nearly forty years, Bell admitted he shot Officer Piagentini. In a separate legal move in California, Bell also pleaded guilty to playing a role in the murder of the San Francisco police sergeant, John Victor Young. The PBA assailed the admission to the New York crimes as “a transparent bid to win parole.” According to a transcript of Bell’s March 2012 parole hearing obtained by Judicial Watch, the parole board was skeptical, too. Bell’s reply is uncertain, evasive. “It’s such a long time ago,” he says. In his 2012 interview with the parole board, Bell indicates that the murders of Piagentini, Jones and Young were nothing personal. Just politics. Revolutionary politics. Next week, at the new parole board interview, Bell gets to try again. There are no do-overs for Joseph Piagentini, Waverly Jones, and John Victor Young. (Washington, DC) – Judicial Watch is pleased to announce its newest team member, investigative journalist Micah Morrison. As a senior writer and, later, chief investigative reporter for The Wall Street Journal editorial page from 1993 to 2002, Morrison led the investigations of the Clinton administration. He also reported on union corruption, Indian casino gaming, and the Bank of Credit & Commerce International (BCCI). He was co-editor, with Journal Editor Robert L. Bartley, of the six volume series, Whitewater: A Wall Street Journal Briefing. The newspaper nominated him four times for the Pulitzer Prize. Morrison’s work has appeared in many publications, including The Wall Street Journal, New York Times, New York Post, Daily News, American Spectator and Parade Magazine. From 2007 to 2011, he was a consultant to Fox News for investigative projects, leading the reporting and writing for the Fox News special, “Iran’s Nuclear Secrets,” and contributing to FoxNews.com and the Fox Business Network. A graduate of Bennington College, he is the author of Fire in Paradise: The Yellowstone Fires and the Politics of Environmentalism (HarperCollins). Founded in 1994, Judicial Watch Inc. is a constitutionally conservative, nonpartisan educational foundation that promotes transparency, accountability and integrity in government, politics and the law. In June, Iran passed an important nuclear milestone. Exactly ten years earlier, Iranian scientists inserted a gas known as “hex”—uranium hexafluoride, or UF6—into a lone centrifuge at the Natanz enrichment facility. It marked the beginning of a decade of uranium enrichment that has brought Iran to the threshold of nuclear weapons. No single act has had more consequence in Iran’s brazen and often brilliant campaign for the bomb. One of the leaders of that campaign is Iran’s new president, Hassan Rohani. Mr. Rohani is the ultimate insider, with long experience in Iran’s national security establishment. He led Iran’s Supreme National Security Council from 1989 to 2005. From 2003 to 2005, he also served as the country’s top nuclear negotiator in talks with the European Union and International Atomic Energy Agency, until outmaneuvered by then-incoming president, Mahmoud Ahmadinejad. And he’s sticking with his story. In an interview with the Arabic newspaper Asharq Al-Awsat the week before the Iranian presidential election, Mr. Rohani insisted that “Iran has an exclusively peaceful nuclear program.” Such a bald-faced lie would be laughable, except that Iran keeps getting away with it. The dimensions of the illicit Iranian effort are staggering. Consider that single centrifuge at Natanz in June 2003, when Mr. Rohani was about to take over Iran’s international nuclear negotiations. It was based on designs and components provided by Pakistan’s A.Q. Khan, the nuclear arms merchant who earlier had stolen centrifuge plans from his employer, the European enrichment consortium URENCO. Iranian agents had scoured the global black market for nuclear technology and uranium. China was approached for assistance, then Russia. A clandestine facility in Tehran, operating under the name Kalaye Electric Company, began enriching small amounts of uranium, and testing and developing centrifuges. Uranium ore mining and refinement operations began. The vast Natanz complex was built in complete secrecy. A second possible path to bomb fuel, using plutonium, was opened with construction beginning on the Arak nuclear reactor. All this occurred on Mr. Rohani’s national security watch. By August 2003, Iran had begun testing at Natanz a “cascade” of ten-interlinked centrifuges. The goal? Enrich uranium hexafluoride to the point it contained 5% of the isotope U-235. In sufficient quantities, hex enriched to 5% U-235 will fuel nuclear power reactors. In sufficient quantities, hex enriched to 20% U-235 is one fast enrichment step up to 90% U-235—bomb fuel. Mr. Rohani was a key player in this. In a remarkable 2004 speech to Iran’s top leaders, first reported by nuclear researcher Chen Kane, Mr. Rohani championed the enrichment effort. It was not just about nuclear power, he suggested, it was about the bomb. “A country that can enrich uranium to about 3.5% will also have the ability to enrich it to about 90%,” he said. 20% U-235 is the key to the Iranian bomb. While the technical challenges in building the actual explosive device and delivery system are formidable—and the evidence is considerable that Iran is pursuing both—nothing is more difficult than creating the fuel for the bomb. In 2003, Iran still faced enormous challenges getting to sufficient quantities of 20% U-235. The cascades would have to be bigger and more efficient. Large quantities of low-enriched hex, containing about 5% U-235, would have to be created and further enriched to 20%. The world powers were beginning to take note, calling on Tehran to suspend enrichment activities and moving to cut off international supply routes. Perhaps most consequential, Iran found the United States on its doorstep, toppling regimes in Afghanistan and Iraq. Saddam Hussein was on the run. Would the mullahs be next? Mr. Rohani took control of the negotiating process, looking to buy time for Tehran. In November 2003, Iran informed the IAEA that it would suspend all enrichment activities and sign the agency’s “Additional Protocol” allowing for enhanced inspections. Over the next two years, Iran adhered to its no-enrichment pledge. In February 2006, with the threat of U.S. military action receding, Iran announced that it would not, in fact, abide by the Additional Protocol. The centrifuges quickly started up at Natanz. By June, Iran was running hex into its first 164-centrifuge cascade, reporting to the IAEA an enrichment rate of 5% U-235. By August 2007, 1,968 centrifuges were operating at Natanz. By August 2008, 3,820 centrifuges were at work. 480 kilos of low-enriched uranium had been produced. By February 2009, with 3,936 centrifuges at work and another 1,400 installed but not yet operational, Iran had produced over 1,000 kilos of low-enriched uranium. U.S. officials concluded that Iran now had enough low-enriched uranium to fuel a nuclear weapon, should it decide to enrich further. Which is precisely what it did. In February 2010, Iran began feeding low-enriched uranium into a single 164-centrifuge cascade in Natanz for the purpose of developing 20% U-235. Iran informed the IAEA it wanted the highly enriched uranium for a research reactor in Tehran. By then, news had emerged of another enrichment site: Fordow. Buried under a mountain on a military base near the holy city of Qum, the heavily fortified Fordow plant is thought to be impervious to air strikes. Like Natanz, Fordow had been built in complete secrecy. Like Natanz, when Fordow was exposed, Tehran simply shrugged and moved on. By February 2012, two cascades at Fordow, containing a total of 696 centrifuges, had produced thirteen kilos of 20% U-235. At Natanz, production of the highly enriched uranium reached 73 kilos. The production of highly enriched uranium at both facilities continues to this day, with Tehran careful not to produce amounts that would cross U.S. or Israeli red lines. Iran now has its fuel cycle. The situation is indeed different. Born in a village in Tibet in 1938, he went into exile following the 1959 Lhasa Uprising against Chinese Communist rule. In 1963, he enlisted in the Special Frontier Force, a covert-action military cadre controlled by Indian intelligence. He saw action in Bangladesh and retired in 1983, moving to Dharmsala and becoming a monastery cook. He was not a particularly religious man but is remembered by friends as “honest, upright and a good companion,” Norbu writes. He died two days later, shortly after midnight. Thupten Ngodup was 60. In November, the Chinese Communist Party’s Work Department, Huangnan Prefecture, issued an “urgent notice” of new orders for fighting the wave of self-immolations in Tibet. The notice—translated here by the Tibetan Center for Human Rights and Democracy—offers a glimpse into the mindset of Tibet’s rulers, their methods of collective punishment, and what they fear most: disorder. Translation of translation: there is a conspiracy afoot, comrades, a conspiracy against the nation. That is, treason. Translation of translation: it’s not just students anymore, it is spreading to the masses. We are worried. And when we are worried, pain and suffering follow.